Isn't it great how the Senate can just adjourn without even considering the creation of a budget? Over 900 days (approaching three years) and no budget. Yet, failing to do his job does not prevent Harry Reid and the rest of the Senators from collecting a handsome paycheck, great benefits and a nice retirement plan. All of these perks -- without the hassle of a budget. Whether you like it or not, the House has created a budget for consideration. The problem is that it won't get considered, debated or voted up or down by the Senate -as long as Harry Reid has anything to do with it. Why is this? Is it the Tea Party, the G.O.P. in general? Space aliens? Why is the Senate allowed to vacation without having done its job? Americans have every right to be angry about this. I know I am. 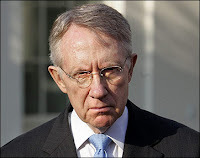 Frankly, in my opinion, Harry Reid should resign or be impeached for being ineffective, childish and a liability to the entire country. Shame on you, Senator. In my opinion, you and those like you give our government a bad name. It's time to get some people in Washington who will work together to help straighten out this mess we're in and actually earn their paycheck.